Daniel Braddock was happy to take tours by appointment, and has since retired. Former White Pine County high school and grade school band uniforms are included among the exhibits at the museum. Downtown McGill today is the home of the McGill Drugstore Museum. Step into a time machine that will take you back to the period during Watergate, disco dancing as well as times before, and when you do you'll find yourself standing in the McGill Drug Store and Company. 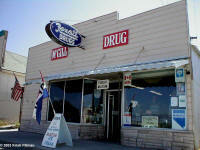 McGill Drug Co., which stands on the east side of U.S.93 in downtown McGill, 12 miles north of Ely; is an old small-town drugstore frozen in time. Brand names whose luster faded decades ago remain on the stores' shelves. Tubes of Ipana toothpaste sit across the aisle from jars of Dippity-do, an industrial-strength styling gel used to hold woman's hair in place several inches above her head. Customers purchased not only manufactured drugs but also home remedies and prescriptions, many of which were mixed in the store. In 1906 construction began on a mill and smelter at the present site of the town of McGill. In 1908 the Nevada Consolidation Copper Company decided to build a company town to house its employees. Approximately the same time the Steptoe Drug Company built the drug store. The corrugated steel-on-frame construction was typical of commercial buildings in western towns around the turn of the century. It was relatively fire-proof and that was an asset. social lines. Socially, McGill was divided into various ethnic neighborhoods. The McGill Drug Store and the Post Office were the only two establishments in the town that everyone, regardless of social status, frequented and felt comfortable doing so. 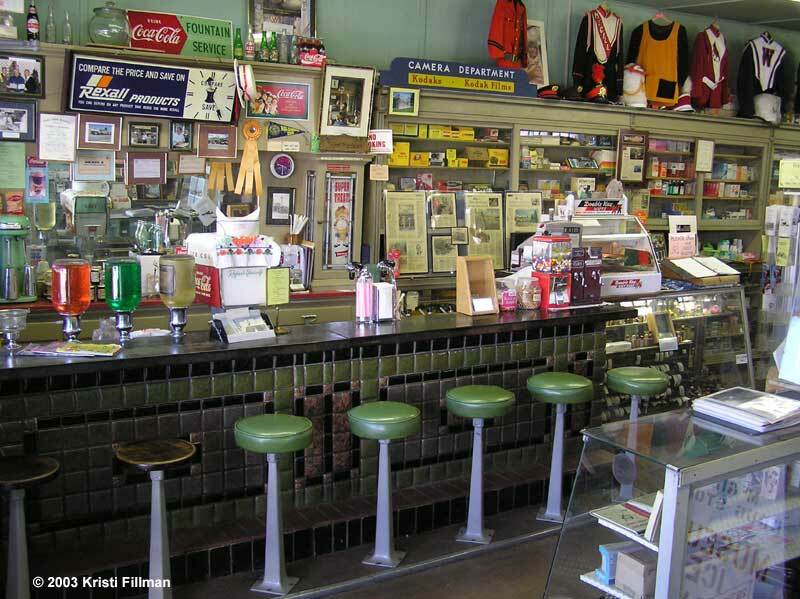 The Drug Store is one of only three working soda fountains in the area. The original fountain was destroyed by fire in 1930 and rebuilt with a unique terra-cotta tile bar. On December 31, 1915 the store was acquired by three investors and incorporated as the McGill Drug Company. It changed hands many times but remained incorporated as the McGill Drug Co., until its final closure in 1979. Our records do not indicate who the first pharmacist was, but they do show that Nick Thomson was there from 1918 until 1924 and that he gave on-the-job training to C.L. Fleming who stayed until 1933. 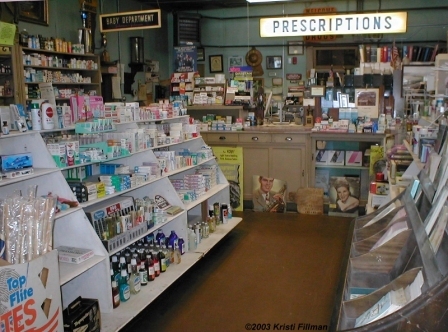 In the late 1930's Gerald “Jerry” Culbert became the pharmacist, in 1954 he became a partner in the store. By the mid 1950's Gerald and Elsa, his wife, had become sole owners of the business. In 1979, when Gerald passed away Elsa closed the pharmacy, but kept a portion of the store open sporadically for a few years. Very little of the 1979 inventory was sold. By the mid 1980's the store was closed permanently. 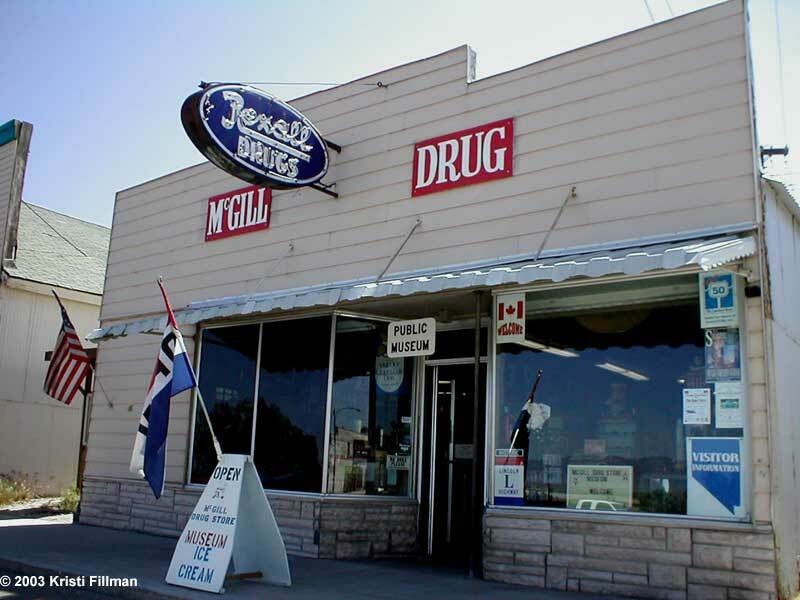 On November 3, 1995 the Culbert's sons Michael, Steven and Danny gave the Drug Store and its inventory to the White Pine Public Museum for historical preservation and display. Many interesting things have been uncovered in the course of inventorying the store contents. A small vile of explosive chemical was found in one the display cases. It was stored in the safe until the summer if 1997, when the Army E.O.D. team from Tooele, Utah came and removed it. all but disappeared! The large chain-store drug stores have replaced most of them, even in the rural areas. It is the White Pine Public Museums' intent to preserve this one largely as you see it. existence. Those that do exist have usually been modernized. Thus, the McGill Drug Store is a time capsule. Even though it closed in 1979, as you look around, you will notice that some of the products date as far back as the 1950's. Of even greater importance is the fact that every business record, every invoice and every prescription filled, as far back as 1915 has been maintained. The opportunity for research is unparalleled. The exact location of every item in this store, when it was transferred to the museum is still in the process of being recorded through the devoted efforts of volunteers who have logged over 1,000 hours of time. At this time, the store is open for private tours upon request. Products from a by-gone era still line the shelves. 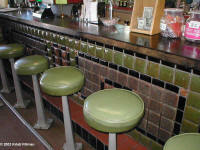 The terra-cotta tile soda fountain bar was built in 1930. One of only three working soda fountains in White Pine County. 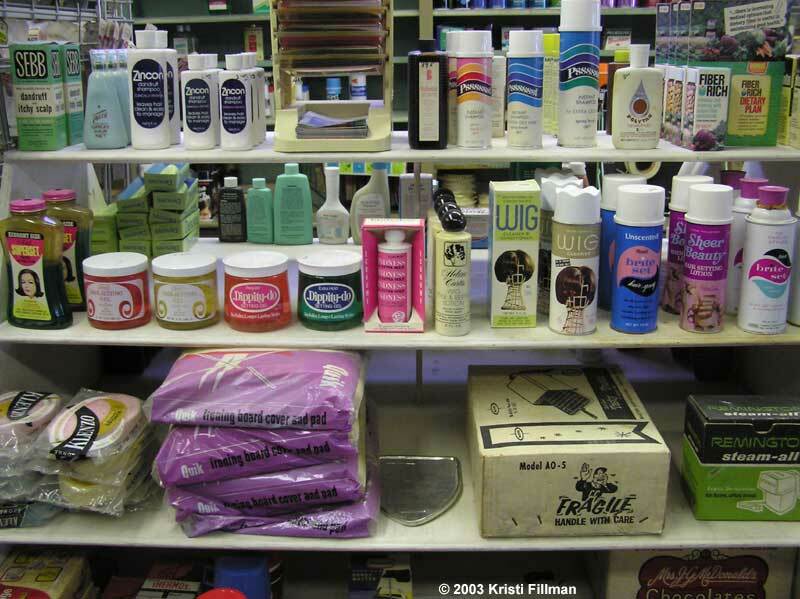 Products still on the shelves date back to the 1950s. 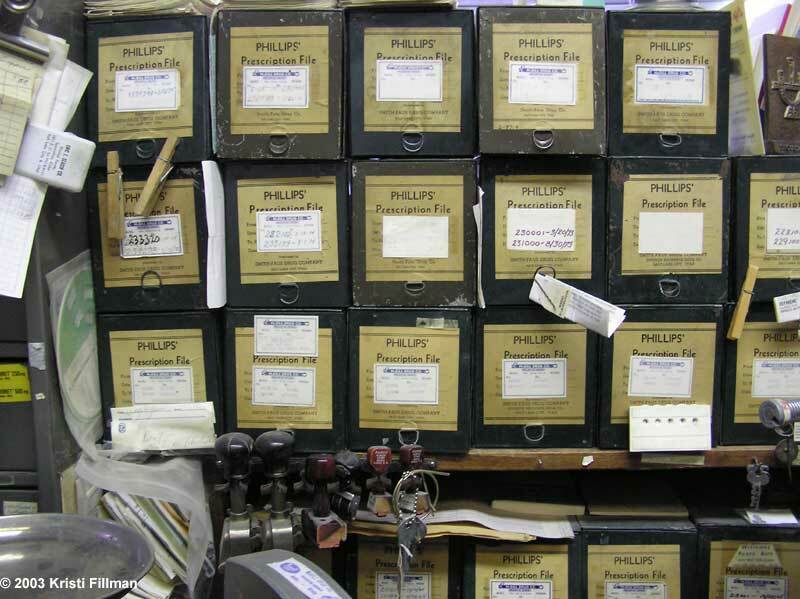 Prescription records are invaluable research materials. 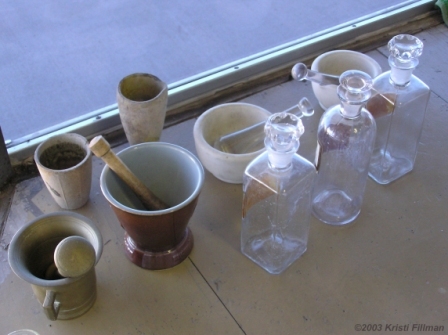 Many original prescription mixing implements are preserved at the museum. Thank you for visiting our website. We look forward to hearing from you soon! Technical assistance by Charter Advertising/Design, Inc.